Ofsted grade schools in four categories, achievement of pupils, quality of teaching, behaviour and safety and leadership and management. We are very proud of our ‘Good’ Ofsted rating. The school strives very hard to provide the highest levels of education for all our children and we were pleased the inspectors recognised that. Our school is always striving to improve so please come and ask us about what we have done since our last inspection. 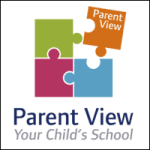 Please click on the Parent’s view logo to tell us what you think of what we do at Bordon Infant School. It really helps us to improve our school for your children. © Copyright 2013 Bordon Infant School. All Rights Reserved.